Holiday Beach Resort v Santorini, Řecko: Zarezervujte nyní! 30% will be charged in case of cancelation,or no show. Holiday Beach Resort is popular with young and budget travelers as well as students from universities from all over the world.Make lifelong friends while learning about your fellow travelers at the most popular pool bar.Located in Perissa few meters from the most famous long black sand beach, we offer you respect comfort and safety to your vacation. It’s close enough to all the action to feel quite central, plus you can easily get to shops and restaurants on foot, although buses run regularly for all around the island. A breath away from the town, it’s got a really quiet and relaxed atmosphere. Every day starts with a tasty hand made breakfast. Do not forget to ask for our daily boat-excursion gives you the unique possibility to visit the still active Volcano with its hot springs and the neighbour island of Thirassia. At night you can join 'Happy Hour' on our pool bar. Meet people from around the world and share your favourite stories making new friends while trying RAKI the local drink, compliments of Holiday Beach. With the pool bar open till 1:30 a.m. every night. Holiday Beach Resort offers Single, Double, Triple or Quadruple guestrooms. All guestrooms have en suite bathroom, hairdryer, safe deposit box, refrigerator, air conditioning, daily maid service and balcony or veranda. 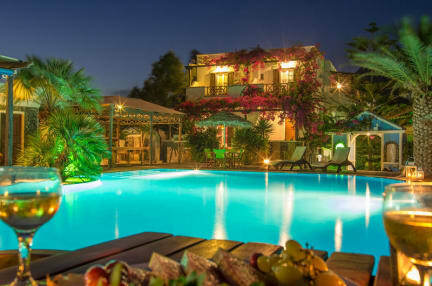 Facilities: Out door large Swimming Pool, Pool bar, Garden area, Free Wi- Fi, Pool Table, AC,. Breakfast room, Volcano and Sunset Tours, Rent a Cars or Motorcycles, Information and Reception Desk Transfer service to all over the island. 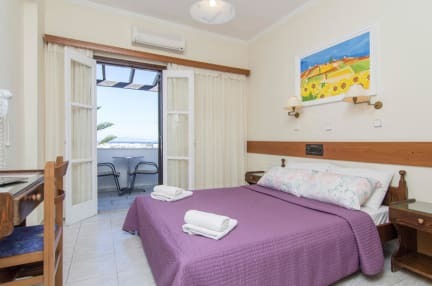 Bed sheets and linen are provided and all rooms come with safe box, bathrooms with 24 hour hot showers, air- conditioning units, refrigerator and satellite TV. Taxes are NOT included, “ overnight stay tax” is 0,50 euro per night per room.